Nick Pollard expressed his gratitude to all the players at Harborough Town following his dismissal at the weekend. Following a dramatic 6-5 loss to Eynesbury, the Bees decided to bring Pollard’s spell in charge at Bowdens Park, which spanned four seasons, to an end. They currently sit 12th in the United Counties League Premier Division having won three, drawn two and lost two of their first seven games. And Pollard said: “Following a conversation on Sunday night it was decided it was best to part ways. “I’d like to thank the players for their effort and commitment and wish them all the best for the future. “They don’t think I’m the person to drive the club on but I’m happy with my performance and I’m proud of what myself and the players have achieved. “That’s the major positive that I will take with me is that the club has improved and progressed while I’ve been manager. “When I took over with 10 games to go in the season, the club were at risk of relegation. “In those games we won four, drew four and lost two and narrowly avoided being relegated. “The aim from then on was to make Harborough Town difficult to beat and take the club forward. “The year after we finished in the top half - the club’s highest-ever league finish - and we did that again last season. 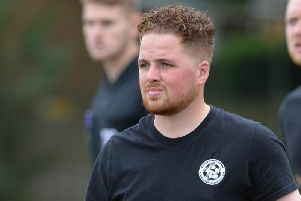 “I wanted to make Harborough Town Football Club a strong, competitive outfit that could hold their own at Premier Division level and I definitely think you can say that is the case now. “I’ve had some fantastic times and thoroughly enjoyed being manager of the club and, like I say, want to thank all the players for their efforts and wish them continued success. “I’m going to take a bit of time out and, since I’ve stopped playing, I’ve been doing a lot of running.